David Manilow, creator and producer of Check, Please! was at Port Edward in Algonquin Aug. 14, 2009 to tape a segment for the fall season. My friend Ed Wolowiec invited my husband and I to watch the shoot. As a Check, Please! viewer it was interesting to watch the efforts and time involved in shooting the episode. In a typical show host and Master Sommelier Alpana Singh and three guests discuss three restaurants they all have dined at. During the episode viewers see pictures of the food and atmosphere while folks at home get a real flavor for the restaurants. Friday night is international seafood buffet at Port Edward’s and I asked David about his favorite item. He must have been very hungry. Check this video out and see what I mean! Click on the picture below to watch. 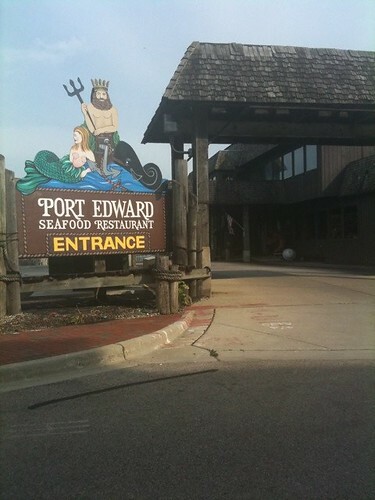 Port Edward is located at the Fox River and Algonquin Road.